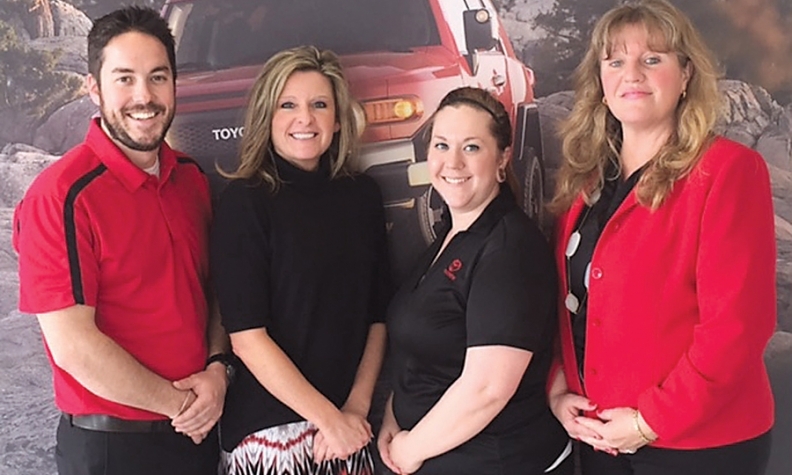 Round Rock Toyota General Manager Caron Corzine, second from left, with product specialists, from left, Brian Gilbert, Jessica Allison and Claudia Markham. In early 2013, Round Rock Toyota in Round Rock, Texas, ran a recruitment ad in a newspaper and online seeking two sales consultants. The responses were few and the applicants unqualified. "It was awful the people we had coming in the door," said Caron Corzine, general manager of the store, located just north of Austin. "If you can imagine, we had applications with the spelling of night stocker as 's-t-a-l-k-e-r.' It was not good." So Corzine stopped hiring people to fill sales positions. Instead, she created a new position: product specialist -- people who could be trained to convert Internet leads into appointments and then continue talking to those shoppers about the vehicle while escorting them through the sales process. The results have been so good that Penske Automotive Group, which owns Round Rock Toyota, is taking the idea to other dealerships in Texas. At the Toyota store, the specialists are an important part of the sales process. Not only have they helped boost customer satisfaction scores, but the specialist role itself attracts high-quality candidates seeking a career path in the sales department, which helps to lower employee turnover. Indeed, the program caught the attention of Penske's headquarters in part because of the company's drive to keep its employee turnover rate at about 21 percent, said Penske President Rob Kurnick in January. Kurnick called the concept "an important initiative ... in terms of making the customer experience better" while also offering "a better career track and enabling us to better attract some more talented people." At Round Rock Toyota, which sells about 5,000 new and used vehicles a year, Corzine wanted to hire younger, college-educated people. So she changed the way the recruitment ads read. For example, having management support and training are important to many millennials, people aged 18 to 34. So Corzine asked in the ad: "Do you want to be a part of a supportive team, the best team?" The ad, which ran in April 2013, emphasized a chance to learn every aspect of the job and it offered a career path. It did not mention income, but it did note that Penske, with 244 dealerships, would provide opportunities to grow within the company. The product specialists are paid hourly and given bonuses based on appointments made and the store's overall deliveries. The dependable pay levels appeal to millennials more than a commission-based plan, Corzine said. The ad attracted 62 applications, all from people ages 43 or younger and mostly college-educated individuals with stable careers. "The potential employees were completely different," Corzine said. "They even looked different. It's not just that they were younger, but they were dressed professionally." She hired two candidates for customer relations in the service department and two as product specialists. Of the four, three are still at Round Rock Toyota. Corzine has since hired another product specialist and wants to add three more in the next few months. Six Penske stores will adopt the program: Round Rock Honda and Round Rock Hyundai; Honda of Spring and Spring Branch Honda, both in Houston; and Toyota of Pharr and Hyundai of Pharr, in McAllen, Texas. The stores will start advertising for the product specialists in the next two months, said Curt Imber, Penske's area vice president for Texas. Imber said the product specialist idea is different from BMW's product Genius program, which involves specially trained employees who talk with customers about a vehicle's features. The Geniuses are paid a fixed salary and do not handle sales. Buyers who want to make a purchase are handed over to a salesperson. At Penske, the product specialist interacts with the customer online and books an appointment for the customer to come to the store. That specialist greets that customer and discusses vehicle attributes. If the customer wants to make a purchase, the specialist brings in a salesperson but remains with the customer throughout the process. "There's a familiarity, there's a customer service above and beyond and there's a real involvement with a specialist from start to finish," Imber said. Corzine said Round Rock Toyota's average customer satisfaction score reached the 96th percentile as of March 1 this year, up from the 94th percentile as of March 1, 2014. "The product specialist is setting the customer up for service," she said. "It's called the VIP process. They're telling the customer: 'Let's set a time for you to come in; I'll have a parking spot with your name on it. By the way, here's a video of the car that you're going to see, I'm going to greet you and I'm going to introduce you to my assistant sales manager.' They're setting the customer up for the other people who'll be involved in the process." The store's Internet closing ratio -- the number of Internet leads that result in a sale -- used to linger at 7 to 8 percent before this program. It is now 16 percent. The store's sales employee turnover rate is down, though Corzine did not give details. "Our salespeople are benefiting from these product specialists," she said, because they can spend their time working with more customers and closing more deals. And they are making more commissions on higher volume. She added: "It's helped raise morale."